The writing exercises consist of a number of short, open writing assignments. Each assignment contains clear instructions about what to write and how many characters you can use. The writing exercises are corrected and marked within 24 hours after you complete them. During correction, the exercise is unavailable to you. As soon as your writing exercise has been corrected, you will get a notification by email or in your profile. To see the feedback, go to ‘Results’ in the top menu. Click on ‘Writing’ in your scorecard and select the exercise. You will get a pop up screen that shows your answers. 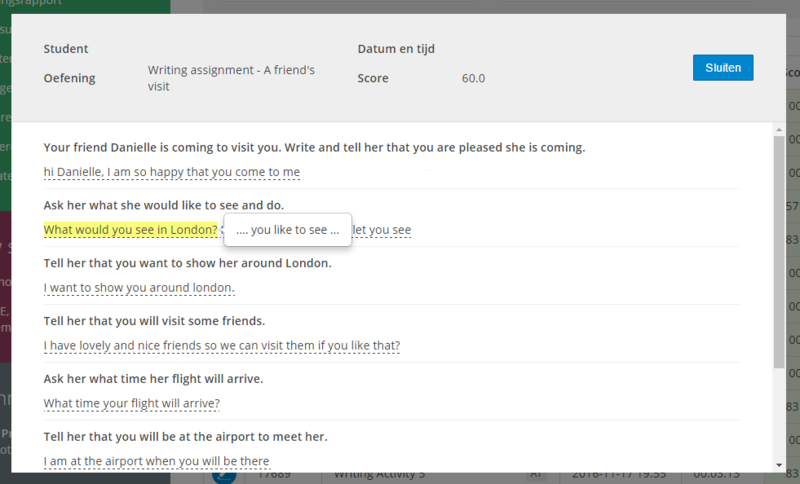 Hover over a sentence to see the feedback you got.